The author of this article very recently had the brilliant idea of doing a quick shopping excursion to Gibraltar while travelling back from a trip to Tarifa. It´s been a few years since the last time she had travelled by car to Gibraltar, so what she found there caught her completely off guard: Getting stuck in the endless queue at the border. Let’s suppose you´re enjoying one of our cars during your holiday and fancy a day trip to The Rock for some shopping and / or sight-seeing. For convenience of course you want to drive there by your own means. So far, so good. But if you don´t want to bore yourself senseless in a semi-cataleptic state inside your car for far too long, you might consider the options presented below. 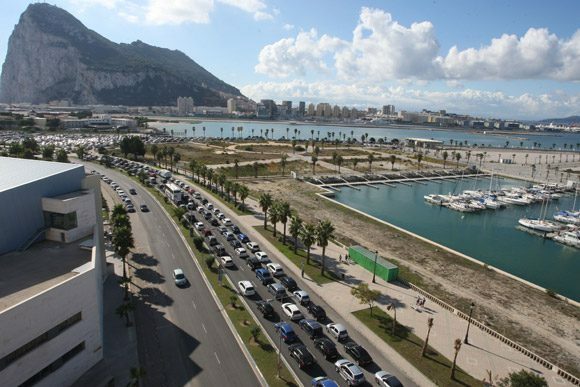 According to official data, about 36,000 people cross daily the border from La Linea to Gibraltar, along with 10,000 vehicles, 180 trucks and 40 buses. We won´t go into further detail, the pictures speak for themselves. Even if you endured the queue, once in Gibraltar, what are your plans? Parking space is very limited and costly. Thus a good alternative might be parking in La Linea, walk across the border and then take the public bus. Highlighted in blue you can see the lane you have to take to Gibraltar and the nearest car parks in La Linea de la Concepcion. There are two underground public car parks located about 800 metres from the border; one is situated at Plaza de la Constitucion and the other one in Avenida del Ejercito / Avenida del Mar. The rates of both is 2.21 € / hour. Just after the border is located the bus stop; there are several city buses that go directly to the centre every 10-20 minutes. There is also a red Double Decker bus which serves the route between the border and the city centre every 15 minutes. An adult single fare currently costs £1.00 and an all-day Hoppa ticket costs £1.50. You are still decided to go to Gibraltar by car? Then we give you some more tips on some requirements.The main requirement is patience, for the queue in and out of Gibraltar. All our cars have air conditioning but don´t travel in the summer without a bottle of water. You´ll need a valid passport or ID. The entry into Gibraltar, of course, is free. In Gibraltar, unlike most British territories, it is mandatory driving on the right, as it shares border with Spain. A good alternative is to drive to Eurosport Road and park in the Morrisons supermarket car park. From there it’s about 600 metres walk to Main Street. If you want to do excursions in Gibraltar, we suggest an excursion by bus or taxi. It is forbidden to take your car to the Nature Reserve, one of the best attractions of Gibraltar. Hi there, thank you for your information. I am planning on going to South of Spain in June and would like to go over to Gibraltar and take the ferry to Marocco for a day or so. Could you pls be so kind and tell me, if I leave my rental car, where should I leave it in Spain? Which is a safe car park to leave a car at least 24hrs? Also, when crossing the boarder is it easy to go to the ferry? Thank you! https://goo.gl/maps/kLADwydR6L52 .You can either take a taxi or a bus or walk there. Hi, we parked at Alcaidesa Marina parking in La Linea de la Concepcion, which is just side by side to the frontier, it cost me 9€ per one whole day. I used Parkimeter for the booking. Just don’t get lost at the roundabout in Av. Principe Asturias, we would not have found the parking without the information in the booking e-mail from that company. Thank you very much for sharing your impressions George! I found a very recent post with all the info needed to park either at the border or once in Gibraltar. Although it’s in Spanish, you can find the list of car parks available, on and off street with fares, schedules and even locations in google maps. It helped me a lot. Hope it helps you too! Thank you Andy! Best regards! We are thinking of driving our motorhome to Gibraltar and do not know where to park up, can anyone suggest the nearest place to park for our hols. 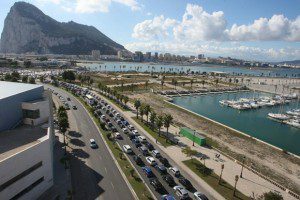 We found this page http://www.areasac.es/v_portal/apartados/apartado.asp?te=3428 about service and parking areas for motorhomes in La Linea, very close to the border, you might find it useful, best regards! Very helpful article. I’ve been to Gibraltar before and wish I knew this before I went. Would have parked the car on the Spanish side and travelled across the border into Gibraltar by foot. The checks at the gates were pretty rigorous and took a little while to get through when I was there. However, despite this, I had such a lovely time there up the rock and chilling with the apes. Will definitely be returning (and a lot wiser too)! Good idea with the radar at mijas,as some cars must be doing over 100 kmh at this spot. If it saves 1 life,it will be worth it.